We are excited to share our new bulletin! In it you will find a wide range of events designed to appeal to many interests. Support Brandeis and expand your horizons with new knowledge and opportunities. The bulletin can be found here for sharing between friends, family and community members. Welcome to Brandeis! 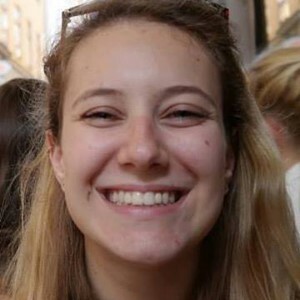 Madalyn Friedberg, from the Central Westchester chapter, who has served as national vice president of fundraising for the past year, succeeded Barbara Sander as the Brandeis National Committee’s national president on July 1. Madalyn joined the BNC in 1973, and will serve as a leader for the organization and its 41 chapters. Friedberg joined the BNC at the urging of a friend. A mother of three young children, she was seeking a group of like-minded lifelong learners. She knew about Brandeis University because her father, David Felix, had been friendly with Lawrence Wien, the founder of Brandeis’ Wien International Scholarship Program. As treasurer of the Central Westchester chapter for many years, she knows the financial advantages of establishing a charitable gift annuity for those interested in supporting the university. In 2015, Friedberg and her husband, Stephen, established a generous charitable gift annuity, planning to create another one this year. Brandeis students like Sophia Glickman ’16 give us hope. A BNC Scholar from Valhalla, New York, Sophia is a double major in biology and environmental studies. She worked as an undergraduate researcher in K.C. Hayes’ laboratory, researching the effects of various diets on the development of diabetes in rats. She chose Brandeis because of its friendly atmosphere and the opportunities it offers students to find their own path. Read her thank you letter (http://bit.ly/1pH9GB9) where she thanks BNC members, like YOU, for making her Brandeis experience possible. Thank you for supporting the BNC Scholarship Campaign. https://giving.brandeis.edu/bncscholarship. Read more stories like Sophia’s here. 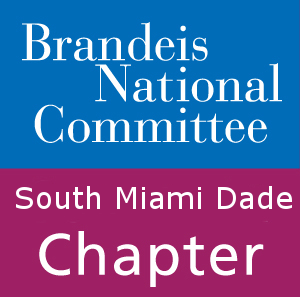 Now’s your chance — as an active member of BNC or perhaps even contemplating being more involved, join an exciting program May 2 – May 4th at Brandeis University geared to Chapter Leaders. Feel connected to Brandeis and see first hand how special the campus is and why your support is so vital. A few more spots are open. RSVP by April 5th, 2016. 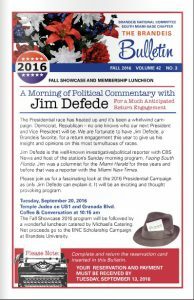 Contact the National Center at 781-736-4171. Did you have a Brandeis Moment today? At BNC’s recent October 2015 NEC meeting, excitement over Tony Goldwyn, ’82 of ABC’s Scandal and Adam Cheyer, ’88 iPhone Siri developer caught the attention of both leaders and members. Find out more moments here.